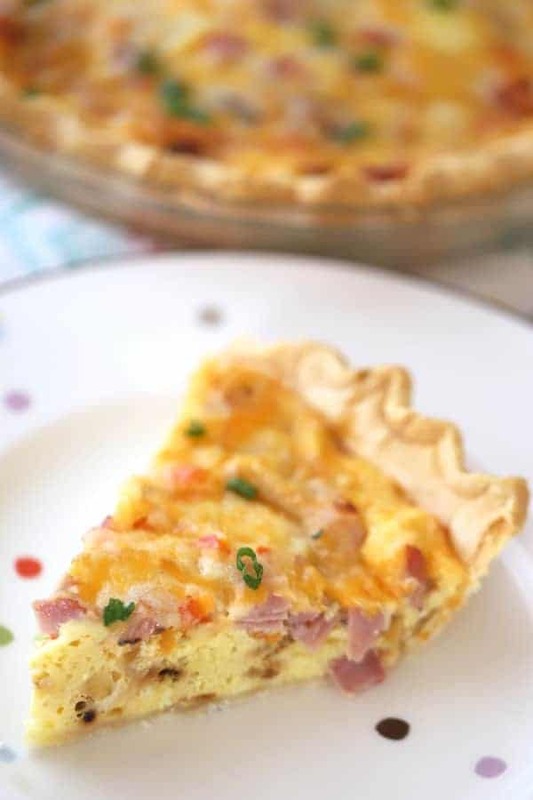 This Easy Ham and Cheese Quiche Recipe is a perfect breakfast quiche recipe. 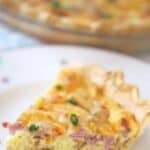 It’s a recipe using pre-made pie crust and all your favorite quiche ingredients. It’s layered with ham, cheese, green onions, cheese. and has the option for a delicious hollandaise sauce. 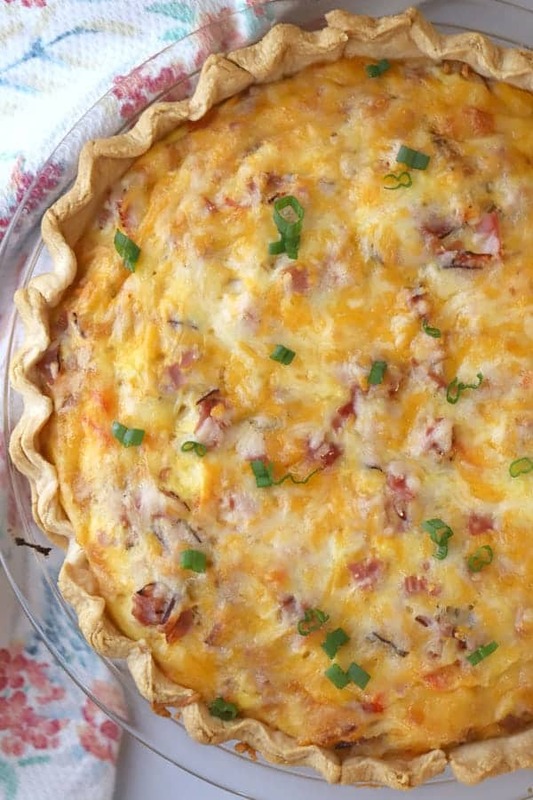 This egg quiche recipe is perfect for breakfast or a weekend brunch. It’s also a great recipe using leftover ham from the holidays. This ham and cheese quiche is also really easy to customize. 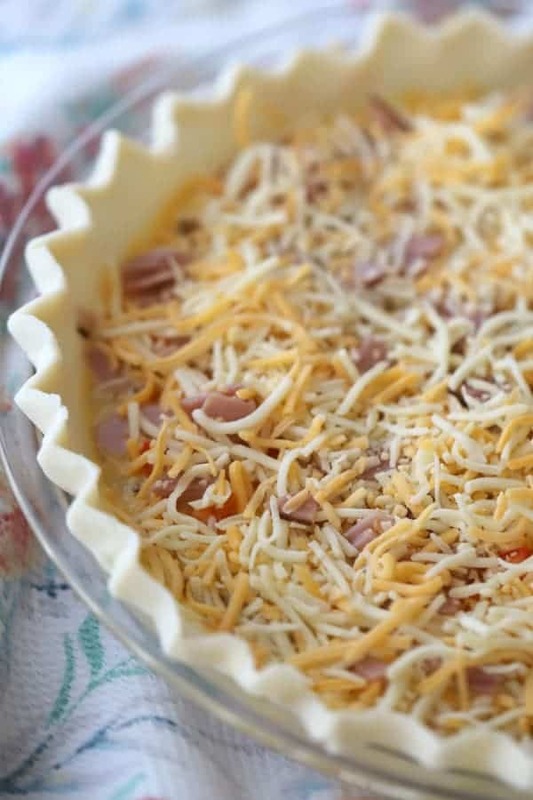 You can add your favorite quiche ingredients such as ham, bacon, peppers, onions, mushrooms and any kind of your favorite cheeses. 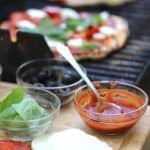 There are a few things you can do to make this recipe a little easier. You can make your own pie crust or this a great recipe to use a pre-made pie crust. If your pie crust if frozen, take it out of the freezer and let it thaw to room temperature before you unroll it. 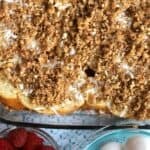 If your pie crust is in the fridge, also set in on the counter for about 30 minutes before you need it to give it a chance to come up to room temperature before attempting to unroll it. This easy quiche can be made 24 hours ahead of time and store in the fridge until you’re ready to bake it. If you make this ham quiche ahead of time, just be sure to take it out of the fridge about 20 minutes before you bake it. This will give the egg mixture and the pie pan a chance to come to room temperature before baking. If you’ve never tried a blender hollandaise recipe, here’s your chance. It only takes a few minutes to blend together and this quick hollandaise is delicious too. 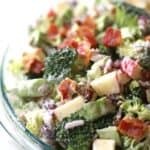 Ham, sausage, or bacon work great in this recipe. Slather your egg quiche in an easy hollandaise sauce! 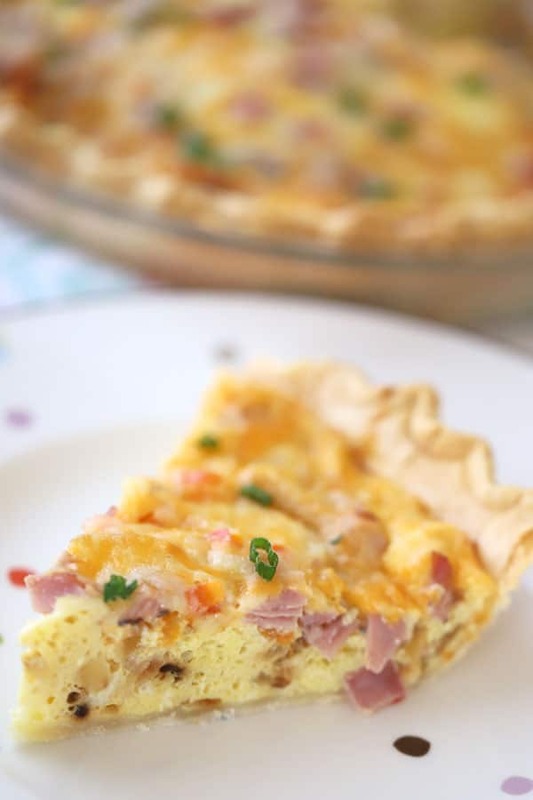 This Easy Ham and Cheese Quiche Recipe is a perfect breakfast quiche recipe. 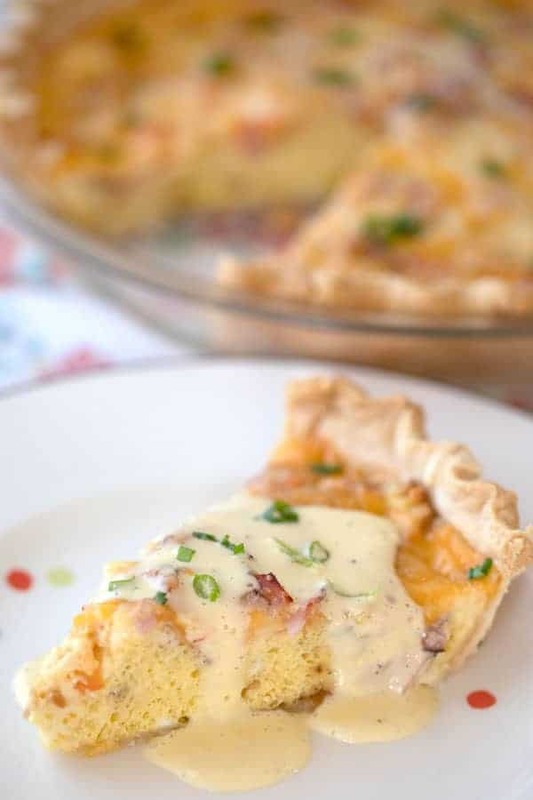 It's a recipe using pre-made pie crust and all your favorite quiche ingredients. It's layered with ham, cheese, green onions, cheese. and has the option for a delicious hollandaise sauce. Take the pie crust out of the fridge and let it get to room temperature. In a small saucepan, melt the butter and add the onions. On medium heat, cook the onions until they are a light caramel color. 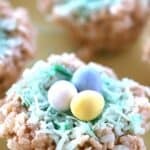 Crack the eggs into a medium-sized mixing bowl. Add to the eggs in the mixing bowl, milk, ham, cheese, minced red pepper, garlic powder, salt, pepper, and crushed red pepper. Whisk with a fork until the yolks are broken and the ingredients are combined. Add the cubed bread to the pie plate and pour the egg mixture on top. Sprinkle the remaining cheese on top of the Egg mixture. 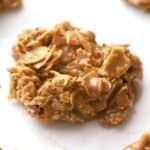 You can make this up to 24 hours ahead of time or bake soon after assembly. 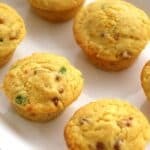 Bake for 60 minutes or until the edges of the egg mixture are golden brown. Let it cool for 5 minutes before serving. Serve with a drizzle of the hollandaise sauce. Enjoy! 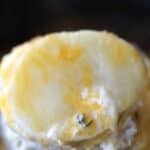 In a small saucepan or microwave, melt the butter. In a blender, blend the 3 egg yolks for 2 min. Turn the blender on low and slowly drizzle the butter into the egg yolk mixture (should take about 30-60 seconds) slowly add the lemon juice and the hot water. Add the pinch of salt, pepper and cayenne pepper while blending. If you want your hollandaise a little thinner in consistency, slowly add 1-2 Tablespoons of hot water.